The eagerly awaited, electrifying new novel from the author of The Emperor of Ocean Park (“Among the most remarkable fiction debuts in recent years . . . A rip-roaring entertainment”—The Boston Globe). When The Emperor of Ocean Park was published, Time Out declared: “Carter does for members of the contemporary black upper class what Henry James did for Washington Square society, taking us into their drawing rooms and laying their motives bare.” Now, with the same powers of observation, and the same richness of plot and character, Stephen L. Carter returns to the New England university town of Elm Harbor, where a murder begins to crack the veneer that has hidden the racial complications of the town’s past, the secrets of a prominent family, and the most hidden bastions of African-American political influence. At the center: Lemaster Carlyle, the university president, and his wife, Julia Carlyle, a deputy dean at the divinity school—African Americans living in “the heart of whiteness.” Lemaster is an old friend of the president of the United States. Julia was the murdered man’s lover years ago. The meeting point of these connections forms the core of a mystery that deepens even as Julia closes in on the politically earth-shattering motive behind the murder. 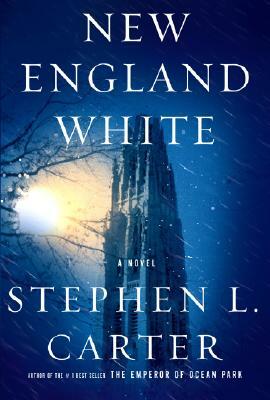 Relentlessly suspenseful, galvanizing in its exploration of the profound difference between allegiance to ideas and to people, New England White is a resounding confirmation of Stephen Carter’s gifts as a writer of fiction. "In the richness of his characters, both major and minor, and the intelligence of his writing, Carter rivals Scott Turow. Expect another bestseller." "[An] irresistible--and highly intelligent--thriller. Carter strikes again."